WFM Vanessa Reid (Australia) came Joint 3rd in the Open. There were several other female contenders. Competing in the Open were Julie van Kemenade, Lynda Roberts and Megan Owens. 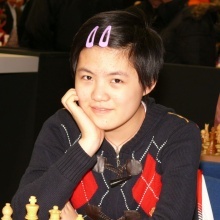 June Evans, Janet Evans and Alyssa Wang were in the Major, and it was great to see Under 8 British Girls champion Aishwarya Lutchman-Singh gaining valuable experience in the Minor.